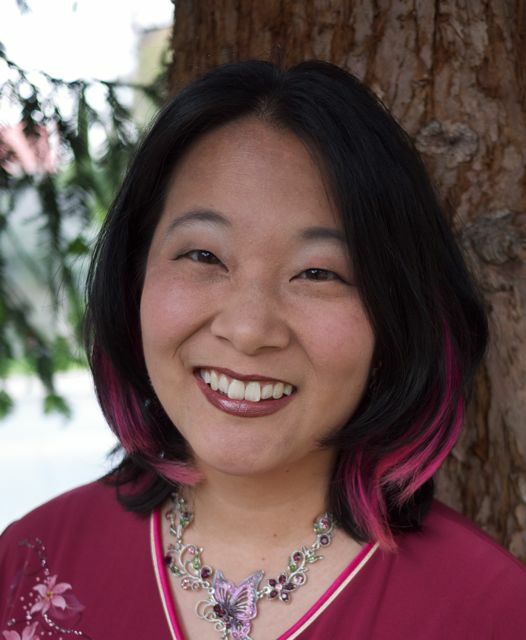 I have prevailed upon one of my friends to be a guest today—Regency author Camille Elliot, who also writes Christian romantic suspense as Camy Tang. She grew up in Hawaii, where she started reading Regency romances when she was thirteen years old. She graduated from Stanford University in psychology with a focus on biology, and for nine years she worked as a biologist researcher. Now she is writing full time, using her original psychology degree as she creates the characters in her novels. In her free time, she’s a staff worker for her church youth group and leads one of her church’s Sunday worship teams. She also loves to knit Victorian and vintage patterns, spin wool into yarn, and is training to (very slowly) run a marathon. Shelley: Camille, welcome to my blog! We talk about all kinds of things here, from airships to books to lightning rifles, but now and again the subject of costuming comes up. Oh very well, maybe it comes up quite often. You’re a skilled maker and crafter—can you tell us a little more about what you do when you’re not writing books? Camille: I absolutely love knitting. I actually knit when I’m writing–I’ll knit something easy while I’m thinking about what to write next, and then drop my knitting in my lap when I start typing. When I’m stuck again, I’ll pick the knitting up again. I learned to knit from my mom, but completely forgot when I grew up, so I relearned using online videos. Very useful for someone who needs to hit the repeat button over and over and over again! At twenty-eight, Alethea Sutherton is past her prime for courtship; but social mores have never been her forté. She might be a lady, but she is first and foremost a musician. In Regency England, however, the violin is considered an inappropriate instrument for a lady to play in public. Ostracized by society for her passion, Alethea practices in secret and waits for her chance to flee to the Continent, where she can play without scandal. But when a thief ’s interest in her violin endangers her and her family, Alethea is determined to discover the enigmatic origins of her instrument … with the help of the dark, brooding Lord Dommick. Scarred by war, Dommick finds solace only in playing his violin. He is persuaded to help Alethea, and discovers an entirely new yearning in his soul. Alethea finds her reluctant heart drawn to Dommick in the sweetest of duets . . . just as the thief’s desperation builds to a tragic crescendo . . . While I am utterly distracted by these characters and their romance, I must ask … do your characters talk about clothes in the book? Alethea grabbed the shawl from the chair, a large silk affair in a lighter shade of green but with the same detailed embroidery at each end. “Your sleeves are too loose,” Aunt Ebena said. “I had the gown made with more ease in the shoulders so that I could play my violin.” Before now, she had practiced with her old gowns which were already cut loosely at the shoulder. She had never had cause to play while wearing an evening gown, and so had this one specially made. Shelley: One of the loveliest things about an author’s public life is the ability to go about in costume without people thinking we’re strange or that we’ve forgotten it’s not Hallowe’en. Don’t you agree? Camille: Oh, definitely! When I go to conferences and award dinners for my romantic suspense, which has Asian characters, I usually wear a Japanese or Chinese costume. My favorite is a black velvet cheongsam with gold trimming. Shelley: Let’s pretend we’re going to collaborate on a costume to match your book cover so that you can sign books at a fan convention. 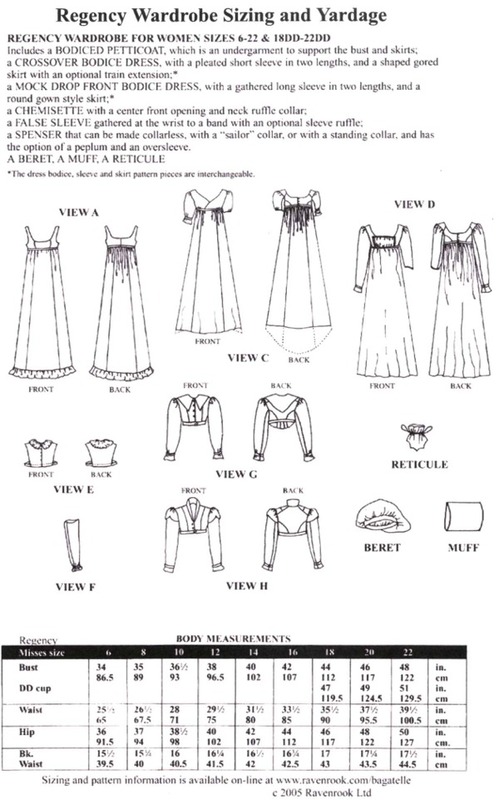 My go-to pattern for Regency clothes was created by La Mode Bagatelle. If one wears a modern bra under these dresses, however, the results are disastrous (trust me), so I recommend first making the Corset Petticoat. And this pattern includes the very spencer with the stand-up collar on your book cover! Let’s use the LMB pattern to make it in a pretty plum velvet to set off your complexion. We could use the LMB pattern for the dress as well, but Jennie Chancey also offers one with multiple versions—some of which could have stepped straight out of the A&E Pride and Prejudice. Choose one here. What fabric would you make it up in? Camille: This is so fun! I totally am intending to make up a Regency gown and spencer (or pelisse) for myself eventually! Those patterns are so lovely! On the cover of Prelude, the gown is white crepe with gold embroidery. I love embroidered fabrics–they’re so elegant and I guess I also appreciate the work if it was hand-embroidered. 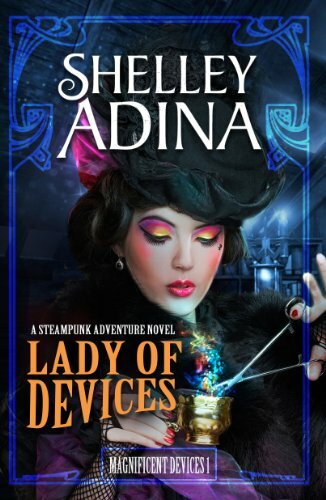 Shelley: The Regency lady would not set foot out of doors without gloves and bonnet. One might order a lovely bonnet or hat here, either already trimmed, or plain to be trimmed using fabric scraps from the dress, along with flowers and ribbon. But, you clever minx, I believe you have a solution for the gloves? 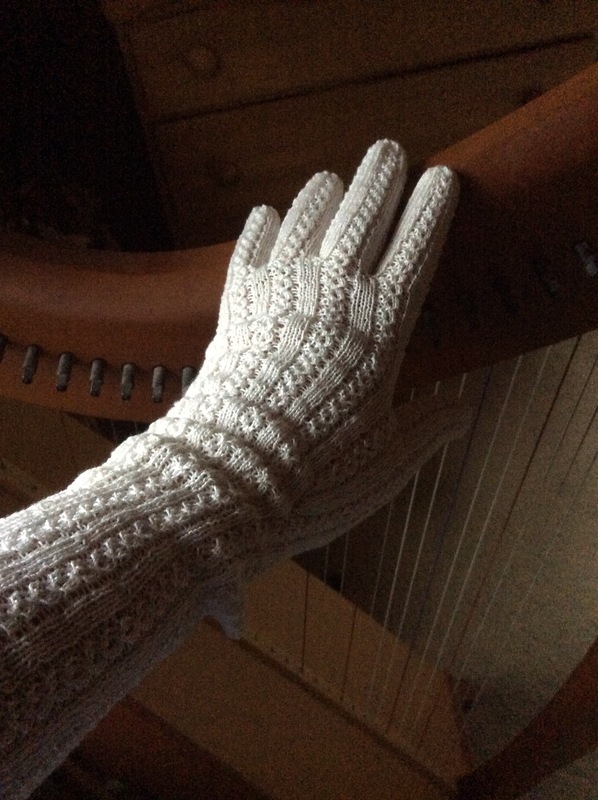 Camille: LOL Yes I fondly remember knitting your lacy full-length opera gloves for you from white cotton thread. Do you wear the gloves often? I forgot to get a picture of them before I gave them to you so we must have a photo day together. Shelley: While I deplore the current fad for the “selfie,” I compromised my principles for your sake. Because really, these gloves are a work of art. Camille: Before I knit your pair, I knit a test pair for myself from laceweight light blue alpaca wool. If anyone’s interested, you can see photos and knitting notes on my Ravelry page. Shelley: This has been such fun–thank you so much for visiting. And look, you’ve brought your famous apricot scones for tea! How lovely–let us adjourn to the sitting room at once! Camille: I love the tradition of tea! Will you pour for us? Thank you for a lovely interview! Hi I have read and and enjoyed The Magnificent Devices up to Resources. I have the next one on my Kindle, ready to read but I have a question. The series starts in 1897. Resources is about 11 years later but you have the date set in 1894. I am confused. I’m sure you’ve been asked about this before. Is there a FEW somewhere? Thank you for writing such an amazing series. I posted a comment here some where but can’t find it. It was about How the series starts 1889 and goe to 1894.. I now see my error and blame it on dyslexia..(I don’t have dyslexia but I can still blame it.) I also said 11 years had transpired but it’s only been five. Sorry for all the confusion. thanks again or an amazing series. I promiss to be quiet now.